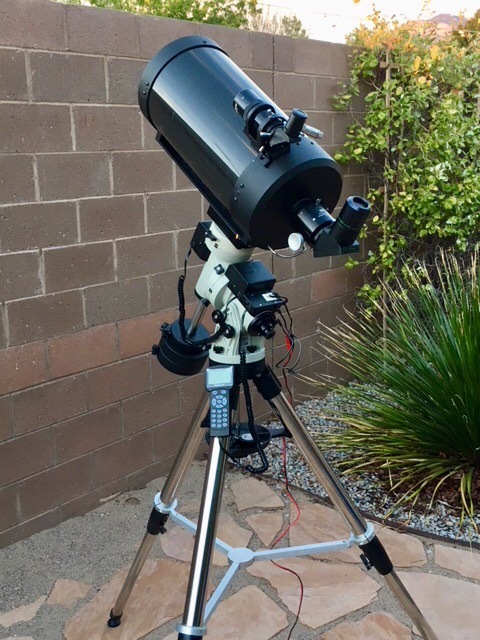 1990s C9.25 Carbon Fiber with Celestron 50 mm RA finder, mounted on An iEQ-45 Pro via ADM dovetail bar. Modified GSO focuser, TV 2” diagonal, TV eyepieces. Here are some photos of my 1985 Super C8 Plus. 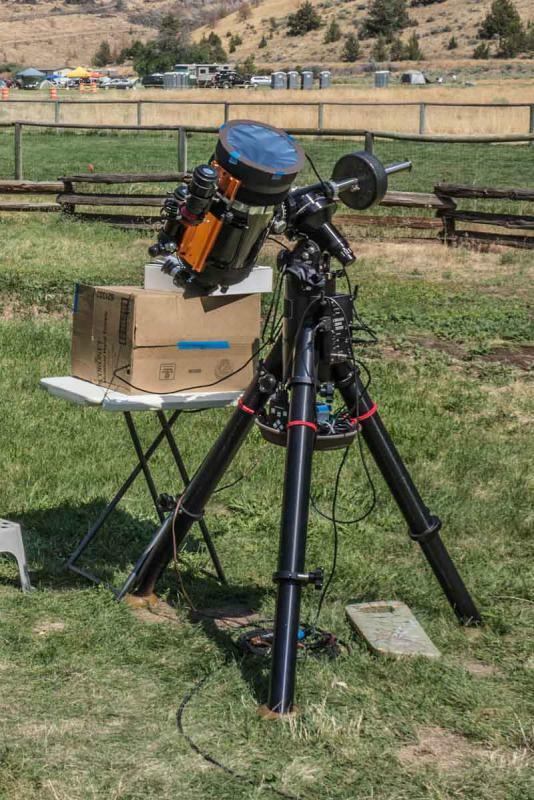 The first one shows it on a Losmandy G-11 mount after photographing the 2017 solar eclipse. I still have the original fork mount with Byers gear drive. The tripod and equatorial wedge are from an earlier Celestron-5. The tripod is sturdy enough to easily support my 185 lb. weight, when I park myself on it sans telescope. Now the fork mount is stored in the C-8's original foot locker trunk. The next photo shows the C-8 carrying a 200 year old Dollond achromatic telescope from around the year 1810. More about this old spyglass is found in this thread - Adventures With a 200 Year Old Dollond Achromat. Finally here are some photos taken with this 33 year old SCT. 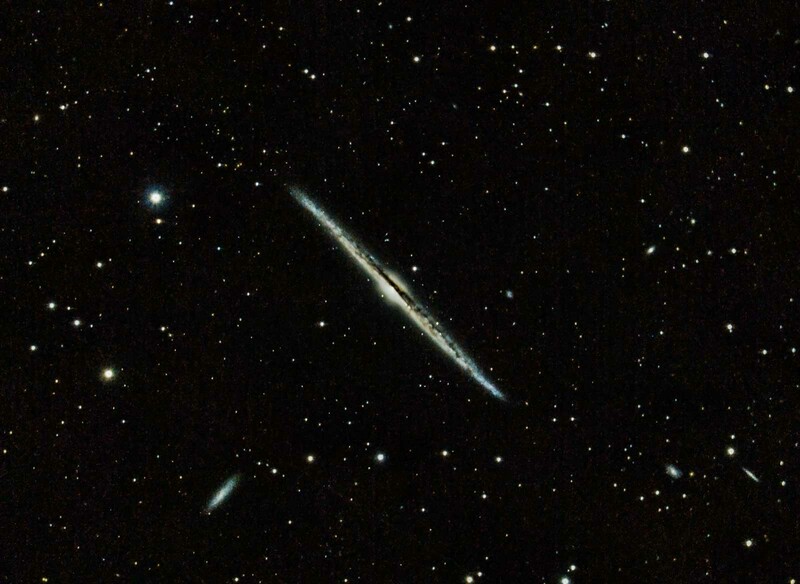 First is the Needle Galaxy (NGC 4565), C-8 with f/7 focal reducer, 1420mm, Sony NEX-5N, 2-1/2 hours total exposure at ISO 1600. 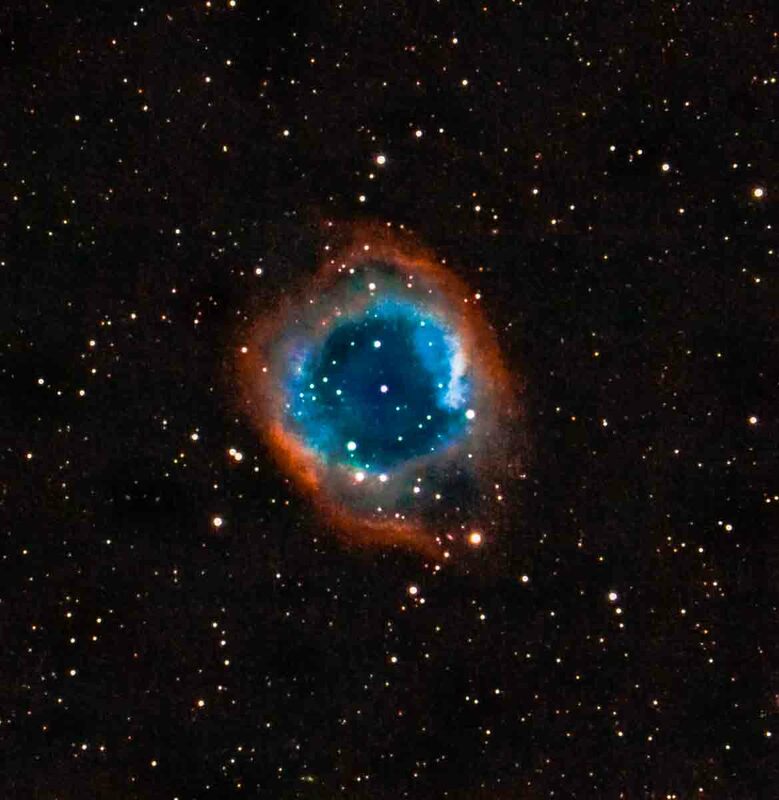 Next is the Helix Nebula (NGC 7293), C-8 with f/7 focal reducer, 1420mm, Sony NEX-7, 4-1/3 hours total exposure at ISO 800. Edited by Rustler46, 11 September 2018 - 02:37 AM. Rustler it's awesome. 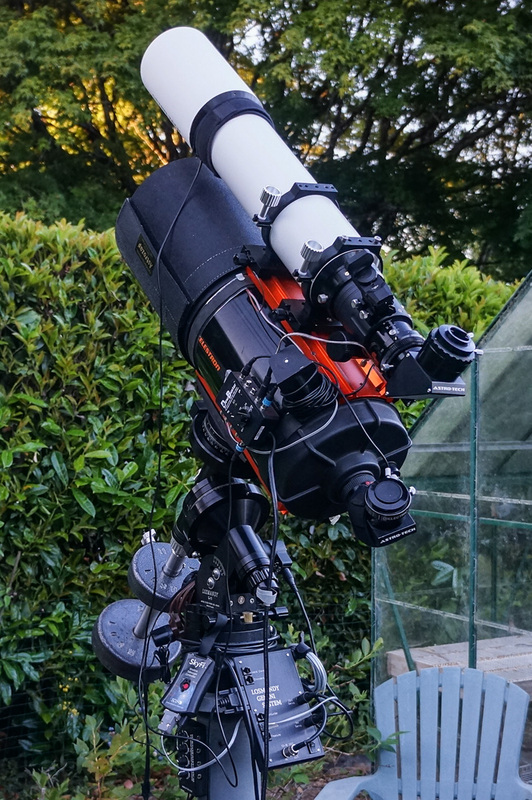 The couple of centuries-old refractor & classical modern reflector is splendid just to look at. And the pictures are at the same level. Thanks for the kind comment. It was very interesting looking at doubles through that old glass. It has about 16X magnification (measured exit pupil divided into the 40 mm aperture). The field of view is a bit over 1/2 degree. So the Moon fits in with some room to spare. The view is quite greenish due to the color of the crown glass. Sort of like the glass in an old Coke bottle. But the achromatic lens worked as designed with no color fringes. The focal-ratio is around f/18. Without a star diagonal viewing objects very far above the horizon was tough on the neck and back. But then it was meant to be a gentleman's spyglass and not an astronomer's tool. Even with the low magnification the closest double I could discern was Beta Monocerotis at 7 arc-seconds. Of course having the benefit of being carried on a go-to mount (Losmandy G-11) was a huge advantage. But using this old telescope shows how far we have come and what the early pioneers in astronomy experienced. Using a modern APO refractor like my Astro Tech AT115EDT provides an interesting comparison. We have really got it good nowadays. (...) We have really got it good nowadays. I have been reading the link you gave with explanations and it's quite fascinating indeed. Regarding your last comment, it's crazy to think that the major astronomers who made huge scientific discoveries would have probably given away a leg, to use a basic modern telescope qualified as trash, lemon or dog by many people. Sorry for the off topic people! 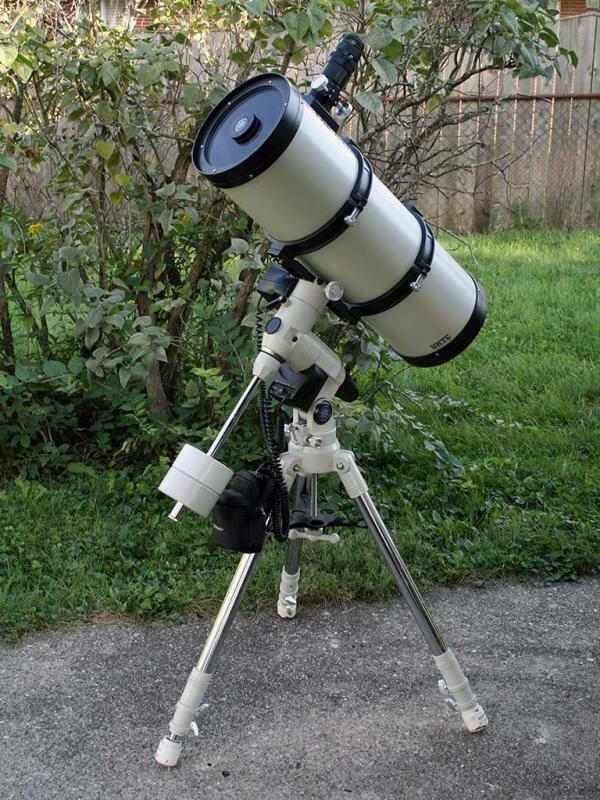 Continue to post nice pictures of catadioptric telescopes! Thanks for the comments and reminder of this thread's topic. 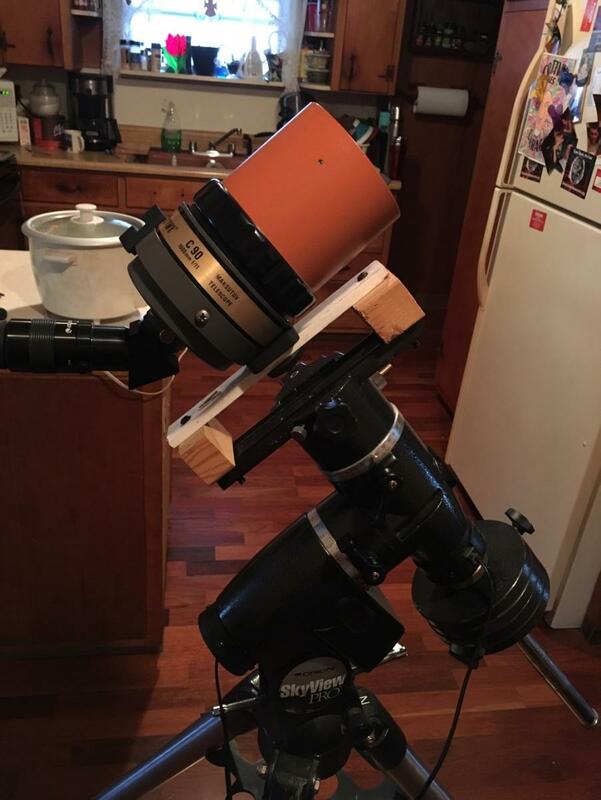 I'll post another photo of my Celestron-8 SCT. 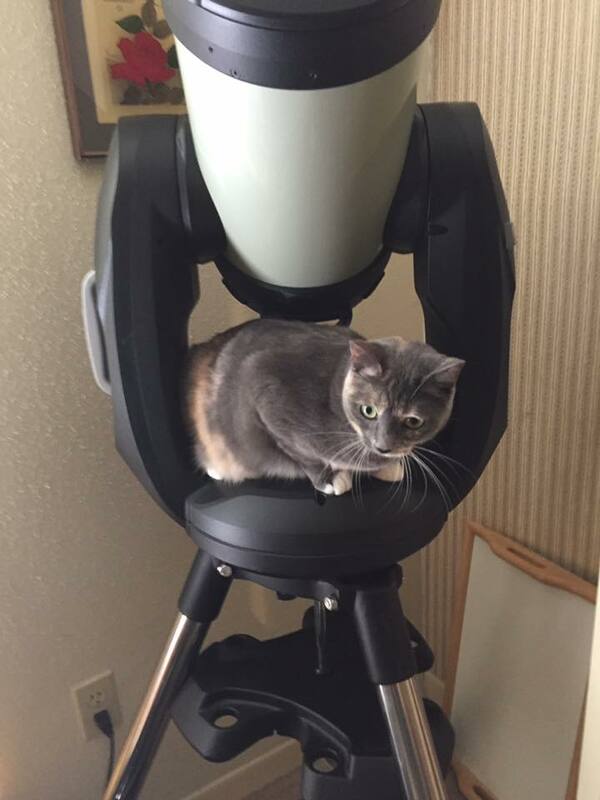 This time there's a different refractor along for a ride. 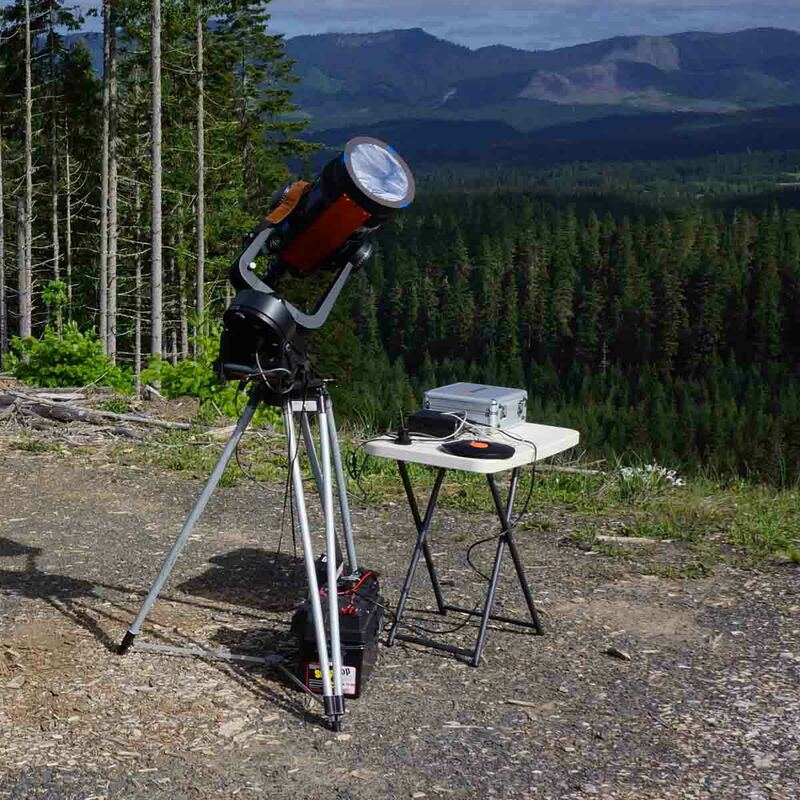 The tag-along refractor is an Astro Tech AT115EDT triplet APO refractor. 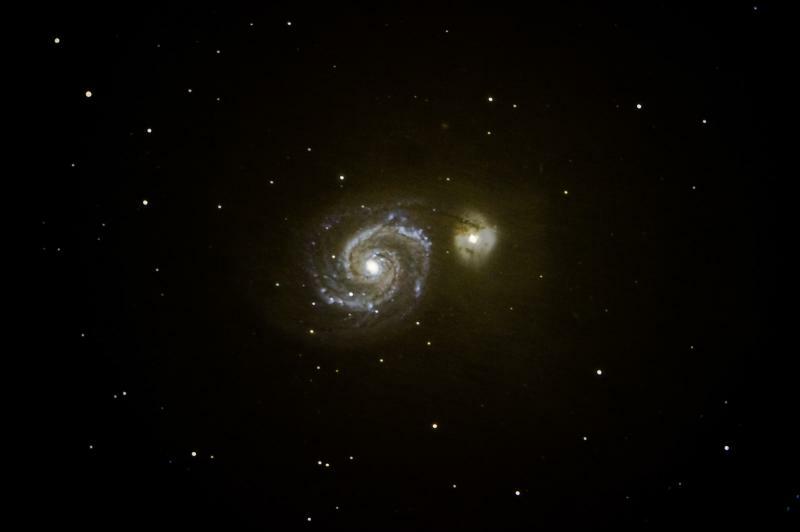 It is interesting to compare the view through the two telescopes. One isn't better, they are more complimentary. 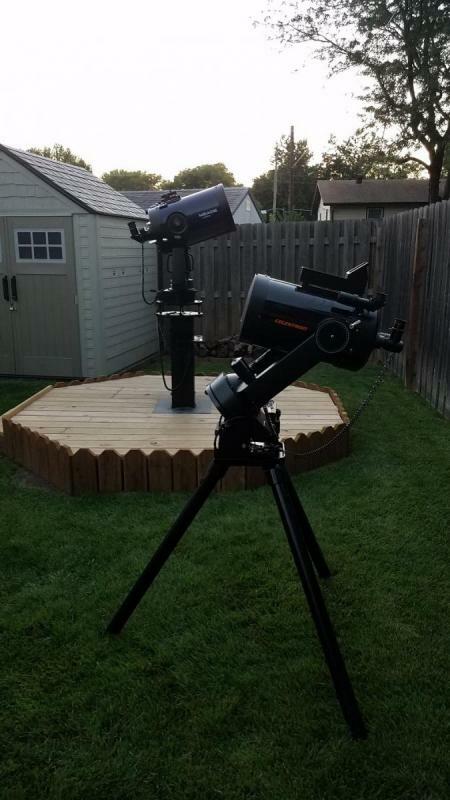 But having both carried by my Losmandy G-11 mount on a permanent pier is a real plus. It is quick setup, polar aligned and can be controlled by my iPad using SkySafari. 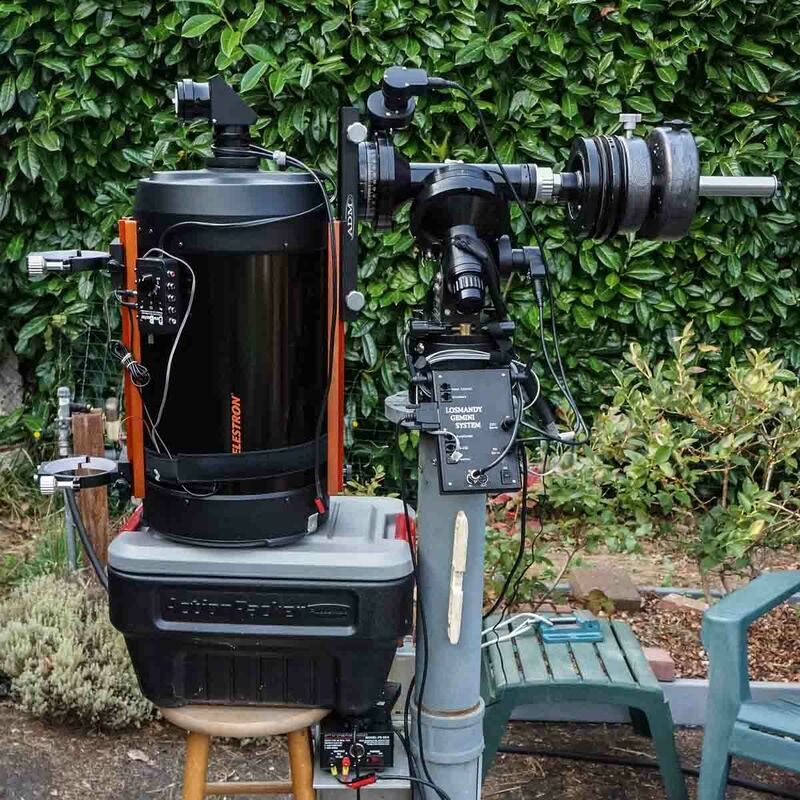 Recently I've been using a Celestron-11 with the same APO refractor. I'll post some photos of that combo. Next is the Helix Nebula (NGC 7293), C-8 with f/7 focal reducer, 1420mm, Sony NEX-7, 4-1/3 hours total exposure at ISO 800. This images shows almost none of the dreaded "black drop effect". This shows the C-8 set up for imaging at a log landing above a clearcut in the Oregon Coast Range Mountains. 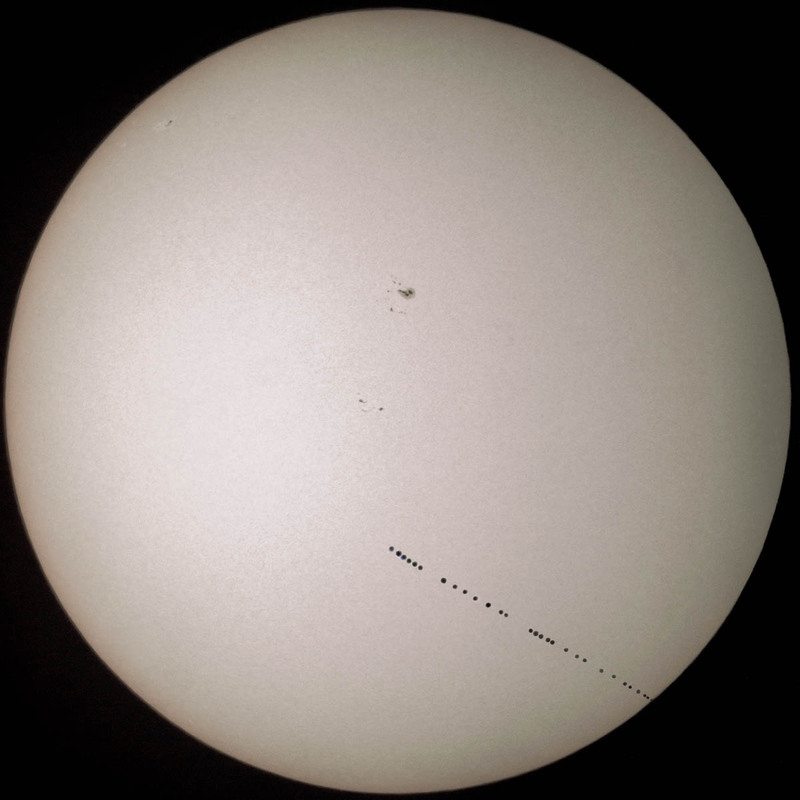 The event was the 2016 transit of Mercury. The filter is a Baader Planetarium white light filter. The above composite image shows part of the 2016 transit of Mercury, C-8, f/7, 1420mm, Sony NEX-5N, ISO 200, 1/4000-second. 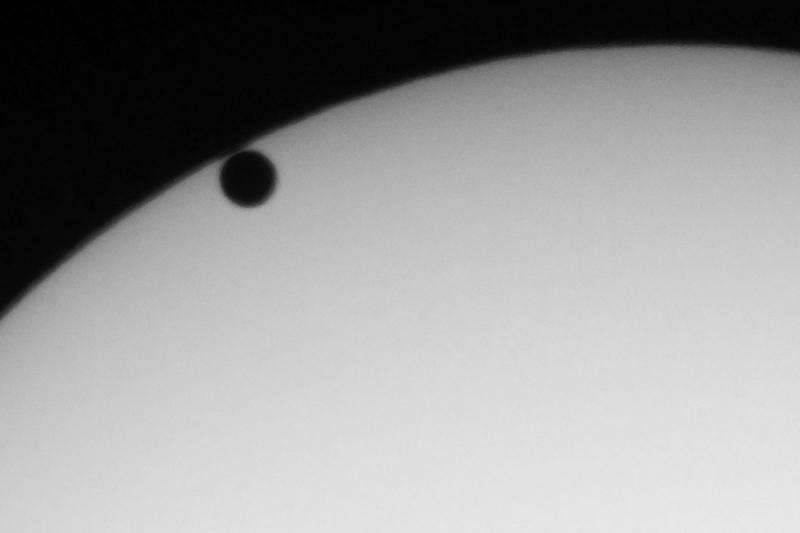 This one shows the transit of Venus in 2012, 2030mm f/10, Sony NEX-5N, ISO 1600, 1/2500-second. This photo, captured just after 2nd-contact, shows little of the dreaded "black-drop effect". This photo shows part of the 2012 annular solar eclipse, C-8, f/10, 2030 mm, Sony NEX-5N, ISO 3200, 1/2500-second. The C-8 did a good job of resolving some details in the sunspots as well as some lunar mountains shown in profile along the Moon's limb. 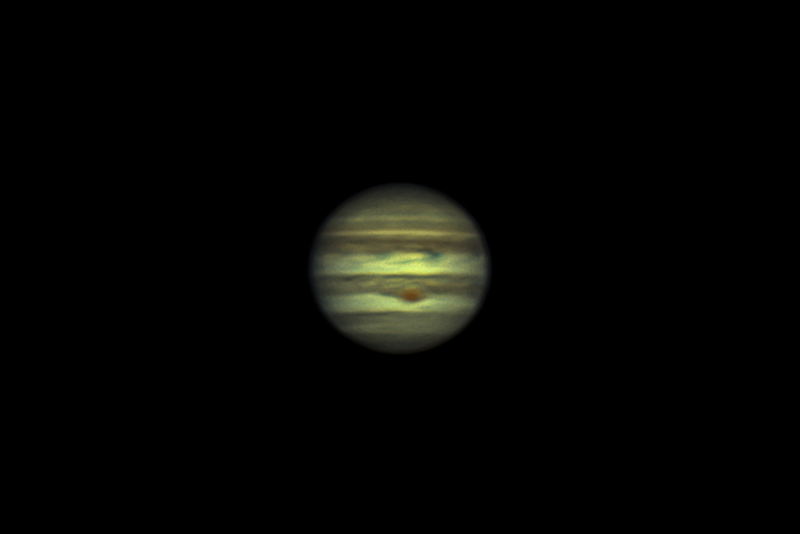 The above shows Jupiter on May 1, 2017, C-8 f/20 4060mm, ZWO ASI290MC video camera, best 1553 of 6212 frames stacked. 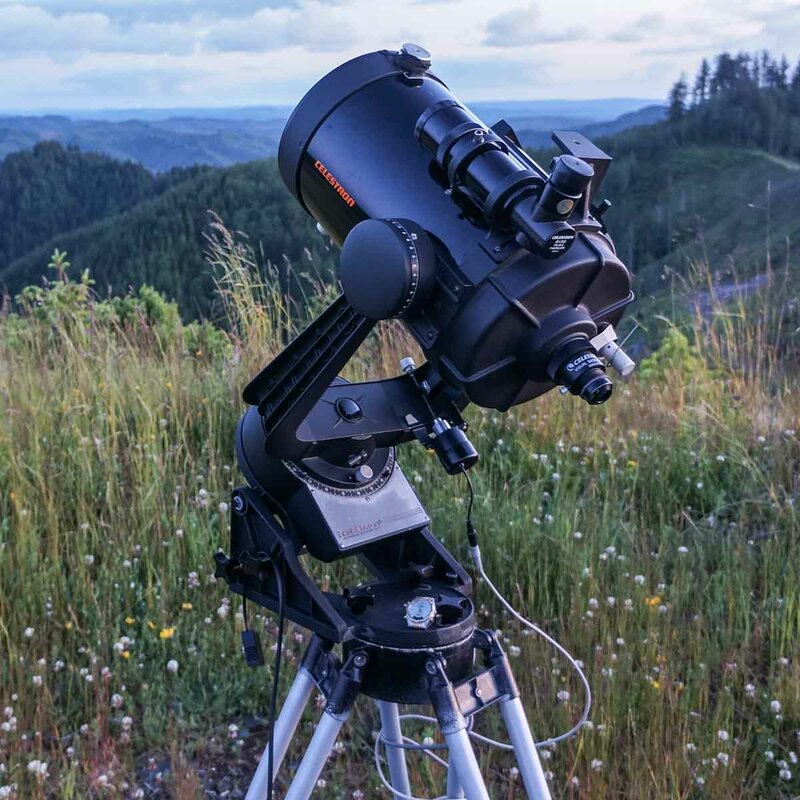 These C-8s are versatile telescopes for both visual and photographic use. Edited by Rustler46, 13 September 2018 - 01:03 AM. Picked up this Ultima 8 used last week. It came with the dovetail bar. 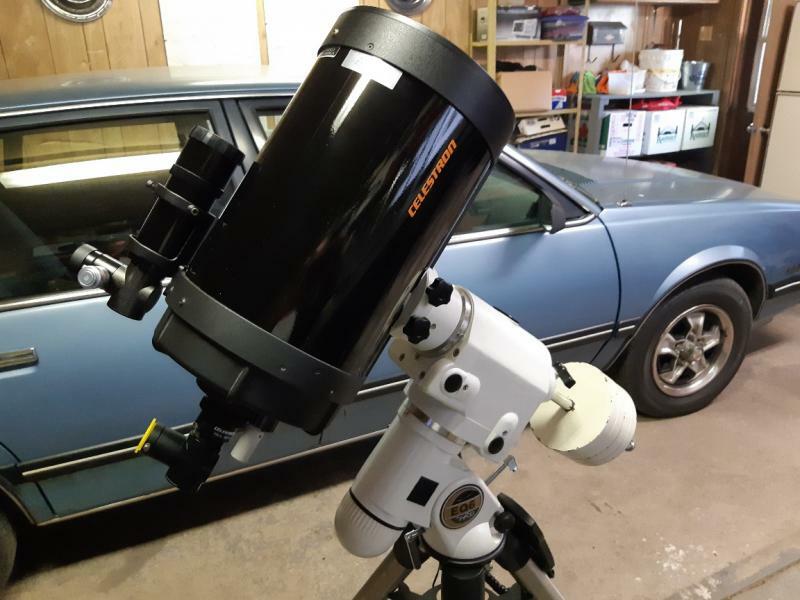 The finder ring is cracked and I have to do some add-ons as I go along, but after waiting 40 years, I can finally say I own a C8, and it will work great on my EQ6 mount..
Is that a Chevy Celebrity in the background?! So cool! My 3rd car was an '88 Celebrity and I used to haul my astro gear with it. Now I use my '07 Jetta which is almost as spacious in the trunk department. Glad to see an 80's classic is still getting some use! Chevy Celebrity a "Classic"?????????? I had two of them when money was tight and raising the kids. Gee, maybe I ought to have kept them! Here's my C8 from c1986. 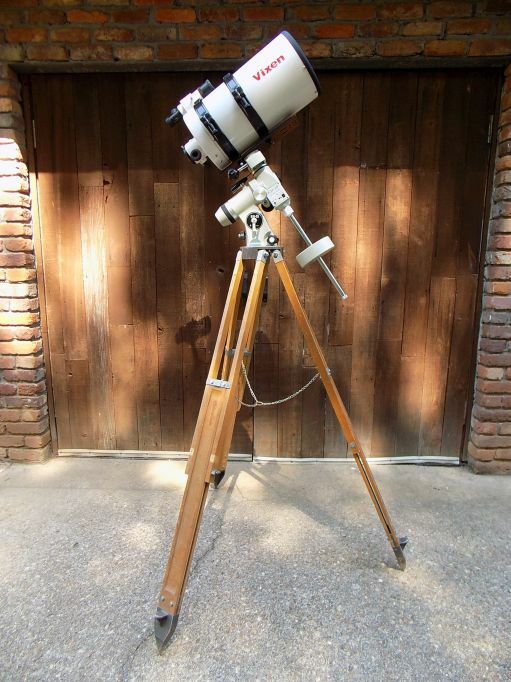 It was originally part of a Super Polaris C8 package Celestron was selling back then. This photo was taken in 2000. Sold the scope years ago. 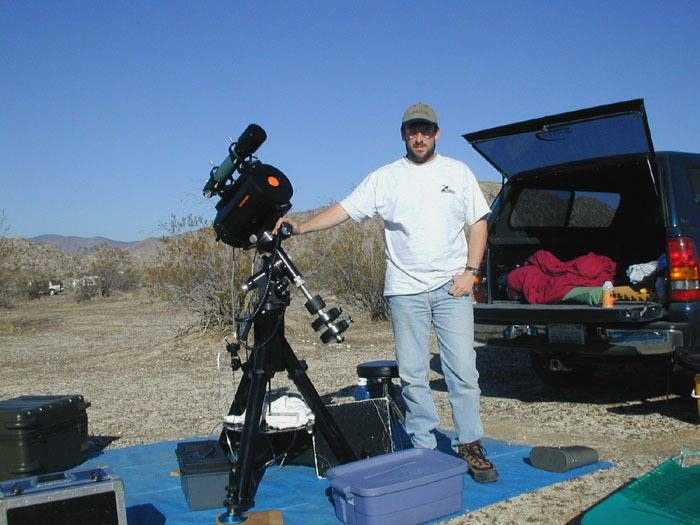 Everyone needs to hold onto their C8 telescopes, mostly in orange color. They will become antiques some day. 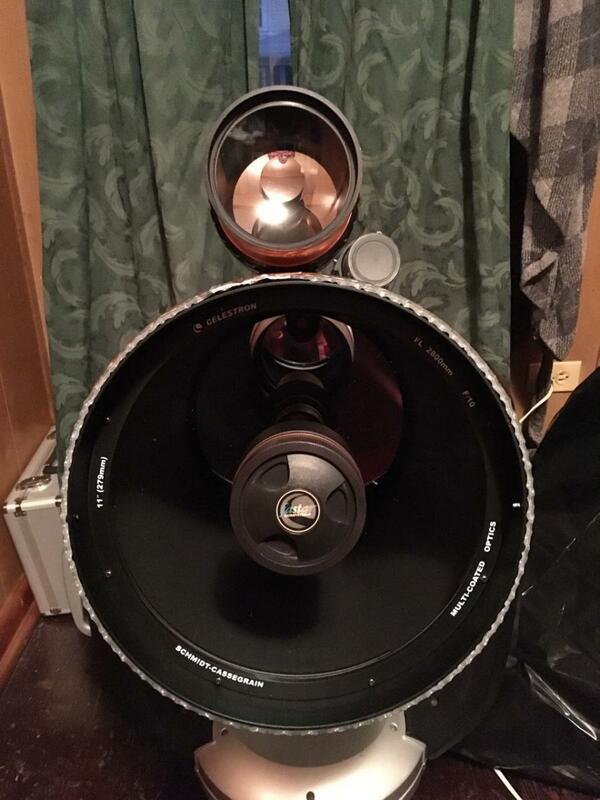 I have the orange metal speckled Nexstar C8 that I plan on keeping, even if I don't use it anymore. Well the original orange tubes are antiques already. I have a 70s era C8 and it has well figured optics but is noticeably out performed by My Edge 8 so the Edge sees the stars and the old orange tube decorates the guest bedroom. And the black designed ones from the Halley Comet in the mid-1980s are antiques. I suppose even the Meade LX200GPS units will soon be antiques (if 25 years is the criterion). Meade 12 and C8 cooling for a night of observing! 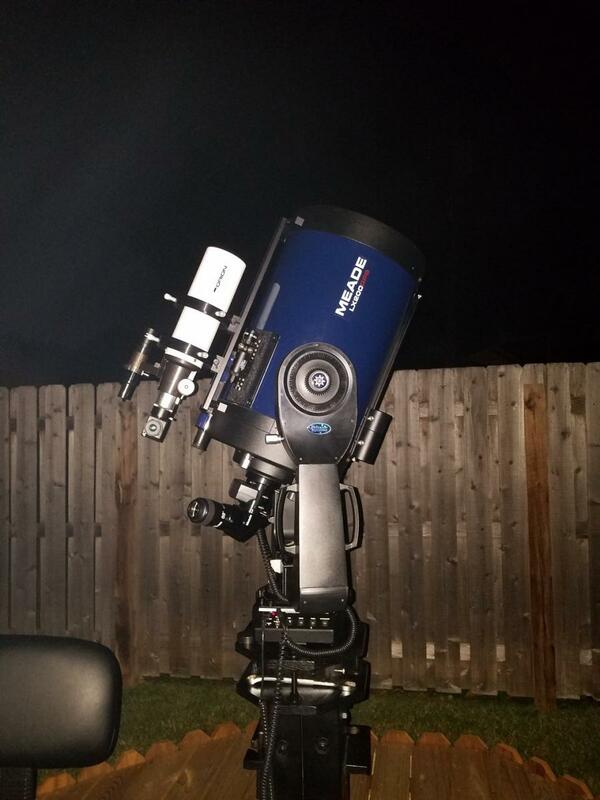 The Meade 12 just got some new toys so I thought I'd post it again! 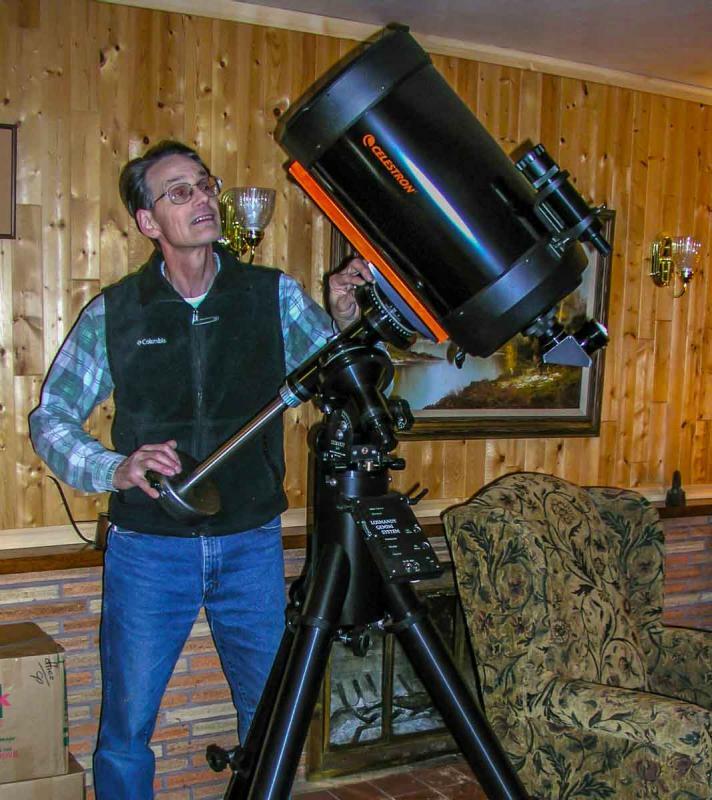 This shows yours truly after unboxing the new C-11 with Losmandy G-11 mount. 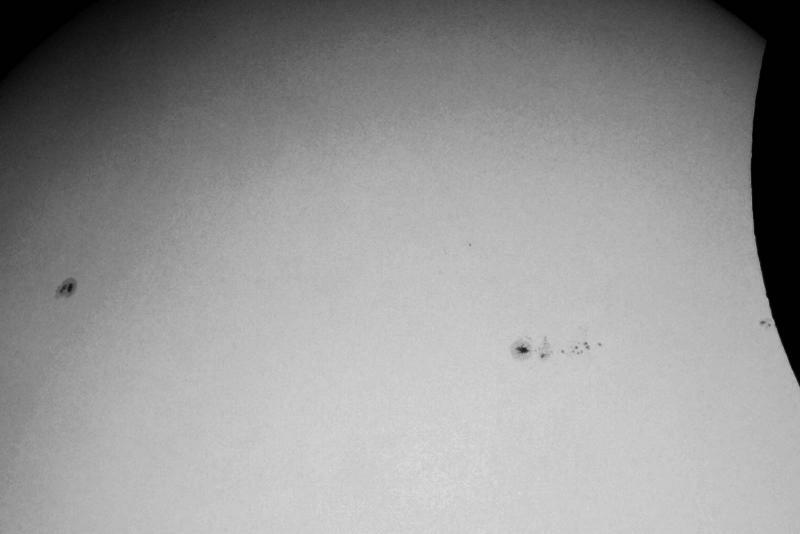 This one shows the C-11 on a permanent pier with Astro-Tech AT115EDT triplet APO on top. Now I am keeping this big SCT as it is a nice complement to my 115mm APO. 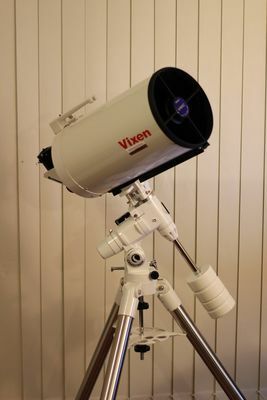 As for the Celeston-8, It might do well reattached to its fork mount for a more portable telescope. Here's my C6 on a recently sold GP mount. 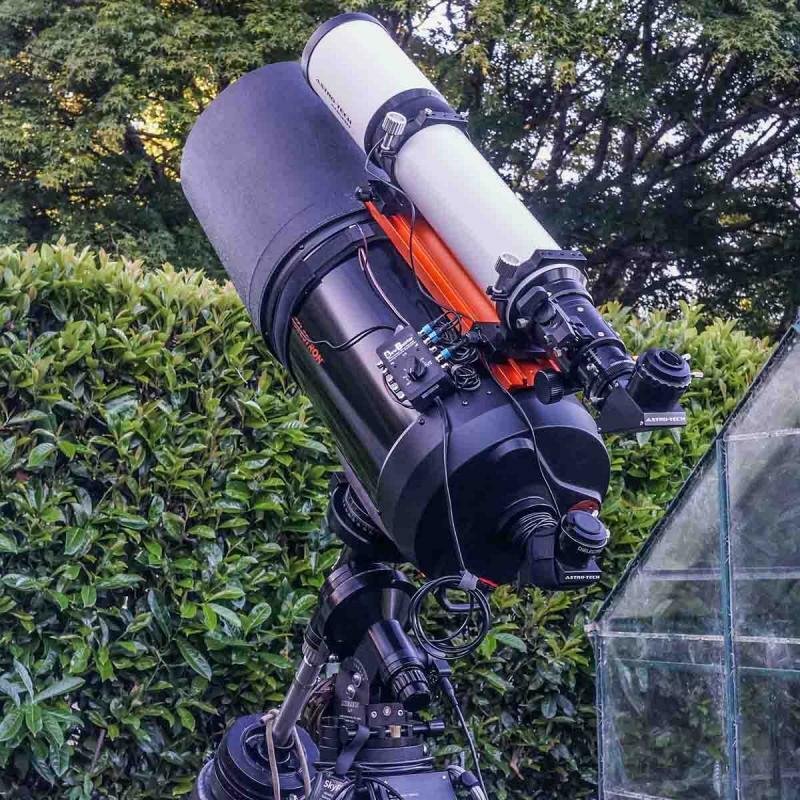 I'm looking at Alt-Az mounts for it but it currently shares the Manfrotto 501/Manfrotto 055cx mount I use with my spotting scope. Honestly, I don't use it much but the OTA was inexpensive enough that I wanted to have it in case I needed a little more aperture. Edited by CSG, 26 September 2018 - 05:13 PM. I was lucky to grab this wonderful example of a late production LXD75 SN8 off of the CN Classifieds. 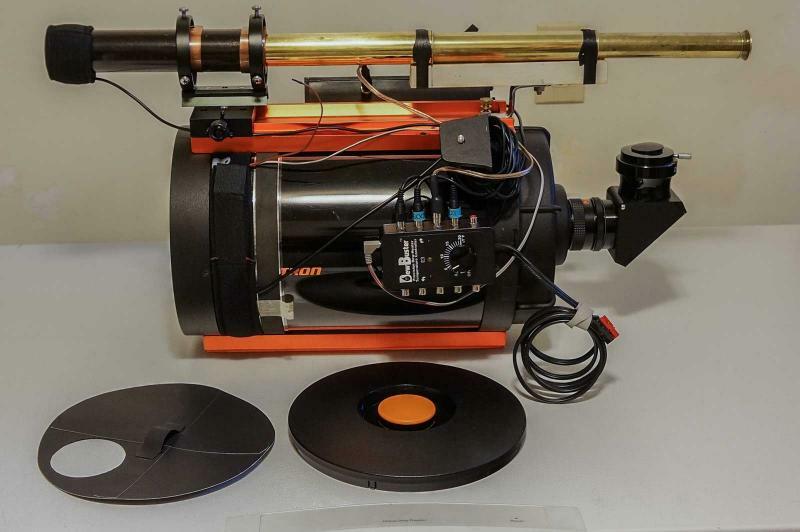 Apparently, the original owner replaced the focuser with a Moonlite, eventually parted out the focuser when he retired the scope and stored the OTA in his observatory where mud dobbers decided to nest inside the tube. The scope arrived yesterday and I had a chance this morning to take the scope completely apart, clean it, and put it back together using a few spare parts from another SN8. As you might expect, the mud dobber mud was everywhere inside the tube, but most if it came off under running water. Mud on the secondary caused a little bit of damage to the coating along one edge, but not enough to having any noticeable effect, and the primary just had a few minor scratches on it. Fortunately, I was able to find the original focuser from my imaging SN8 and it fit this one fine. However, I went ahead and placed an order for a Moonlite. 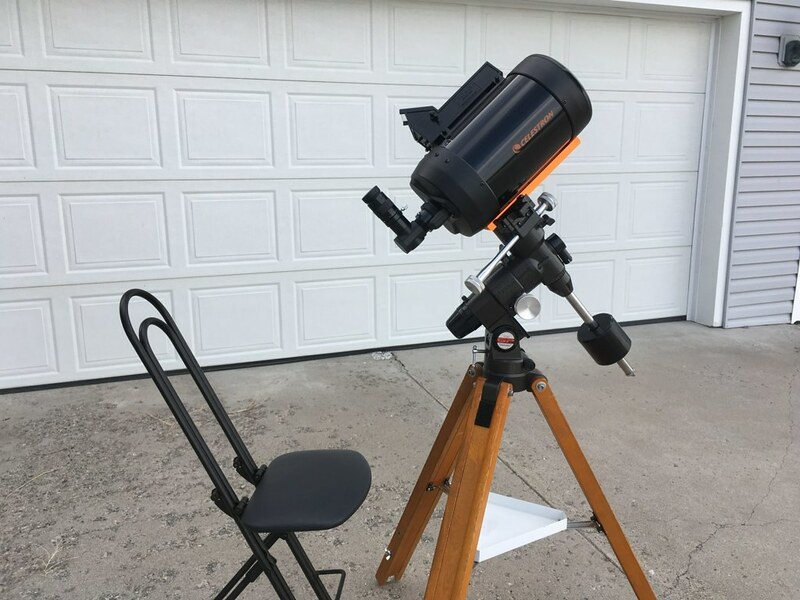 I plan on using this scope primarily for visual, but having the Moonlite will give me the option of using it for imaging as well. I replaced the original straight-thru finder with a 50mm RACI for star-hopping and I already have an Astrozap flexible dew shield for it. The mount is from my original LXD75 N6 with a second weight from another LXD75. So, it came together fine and should see first-light later this evening. First-light was a success! I used a 26mm QX and an 18mm UWA to star-hop from Perseus up through Cassiopeia and over to Andromeda. I didn't bother turning on the mount, I just lightly snugged the clutches and used it manually. All I need to make it complete is to set up my Starbound chair! Edited by jgraham, 29 September 2018 - 09:36 PM.